In celebration of our 500th (and 501st!) follower on Twitter, a photo of the great Harmon Killebrew on Tuesday, August 10, 1971, after socking Nos. 500 and 501 as a member of the Minnesota Twins, at Metropolitan Stadium. And they were no cheapies, both coming off Orioles great Mike Cuellar. 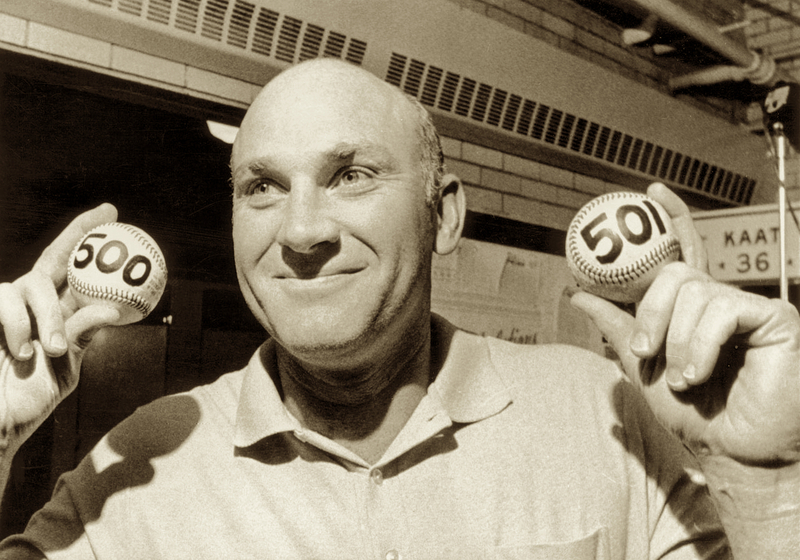 Killebrew, at the time, became only the 10th player to reach this impressive milestone. A 13x All Star, Killebrew played 22 seasons for the Senators, Twins and Royals, finishing with 573 long balls, still good enough for 12th on the all-time list, and was elected to the HOF in 1984. Many thanks to all our followers and readers! As Harmon once said, “Just keep swinging…and you will succeed”. We plan never to leave the bat on our shoulder, and always swing for those fences, and we hope to continue to bring much more photos and stories that you enjoy! A true and genuine slugger from the good old days of baseball. Also a wonderful human being. He was a great player, a team player who could play third and first with solid proficiency. Thanks Tom, for remembering this more than deserving HOFer. It makes me sad and mad though, to think of all the steroid cheaters that are in the Hall now – and the frauds that will follow. It is NOT the same HOF!!! Well, they’re still holding off on letting some of the steroid era guys in, but Killebrew, Aaron et al are a cut above for me no matter who’s in the HOF. Glad you still enjoy my blog! And I’ll second the thanks, Tom, you’re slugging pct. is off the charts–keep getting the fat part of the bat on the ball!